Hibs remain on a sound financial footing despite having racked up a hefty loss for the second year in succession, chairman Rod Petrie has insisted. The Easter Road outfit’s latest accounts show that for the year ending July 31, it was in the red to the tune of £840,000 following taxation, the result Petrie said of choosing to maintain Hibs as a “Premiership club” despite being relegated at the end of the previous season. But that figure is a drop from the £1.2 million loss in the previous financial year even although staff costs fell by a “modest” eight per cent to £3.4m in comparison to the £3.7m spent in the last year in the Premiership. However, while admitting most eyes will be drawn to the profit/loss figure, Petrie insisted a closer reading of the accounts – copies of which were dropping through the letterboxes of shareholders this morning – revealed the club’s finances were strong. A combination of debt restructuring, £6.3m owed to the Bank of Scotland having been cleared and replaced by a £5m interest free ten-year mortgage from Hibs’ parent company which had previously been owed £3m, and a successful share issue resulting in a cash balance of £2.7m, up by £1m. In the six months from its launch in January to the end of July, the share issue raised £500,000 with a further £40,000 brought in during August, lifting supporter ownership, including that owned by Hibernian Supporters Limited, from less than two per cent to a little more than 19 per cent. Petrie told the Evening News: “I think if you’d asked anyone in May 2014 at what was staring us in the face, to come out of it by July 2015 with the strength and financial security of the balance sheet we have, no-one would have predicted that – not even me. Although Hibs’ player and management teams were leaner at the year end, 54 compared to 64 a year earlier, Petrie argued that under Alan Stubbs the squad contained greater quality while pledging to continue to support his head coach to strengthen further. The sale of Scott Allan to Celtic, following a protracted pursuit by Rangers which disrupted Hibs’ start to the season, isn’t included in the latest figures nor are the arrivals of John McGinn from St Mirren, and Dylan McGeough from Celtic, all those transactions having taken place after the year end. Petrie said: “We talked when we launched the share issue of the sporting ambition of the club and it’s a matter of record we paid training compensation to bring John to the club and obviously we agreed a fee with Celtic for Dylan. So we have been able to do things in support of Alan and the coaching staff, supporting the strategy we have to be that Premiership club in waiting. “When you talk finances some people’s eyes tend to glaze over but the fact is Alan has been able to strengthen and enhance the squad and we been able to deal with the difficult situation that was facing us. Having missed out on promotion at the first time of asking, the aim, naturally, is to regain Premiership status at the end of this campaign. Petrie admitted Hibs had been left with the choice of “two ways to go,” when confronted by that shock relegation. 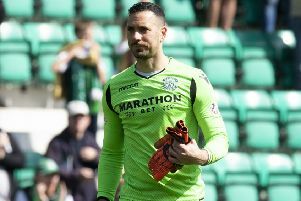 He said: “The parachute payment [of £500,000] that was introduced as part of the play-off arrangement was there to try to avoid the worst ravages of being relegated but that payment in itself would not have been big enough to sustain a club like Hibernian through that process. To that end, at a time when half-season ticket sales are said to be going well, Petrie added: “Without the exceptional level of income that comes from reaching a cup final or through significant transfer fee income, it is not possible for Hibernian to break even as a Premiership club outside the Premiership. “We need to get ourselves promoted and people need to continue to help by coming to games at Easter Road, attendances have a double impact, helping the club financially but more importantly, helping the players on the pitch to win. Hibs’ annual shareholders meeting will take place at Easter Road on Tuesday, December 15.